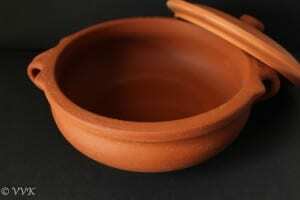 Clay pots or Manchatti is made out of earthen clay. We all know clay is porous meaning it has lots of tiny holes and that property of clay provides the unique characteristics for the clay pots. As they are porous, they retain the moisture during the cooking process. It reduces the acidity of the foods and also their inert property (chemically inactive) makes them not to react with foods. But before using the clay pot you need to process them and make it suitable for cooking and stove top. I just followed the instructions given in the package, but pretty much all the clay pots follow the same. Wash them first with Luke warm water with mild soap and rinse it well. 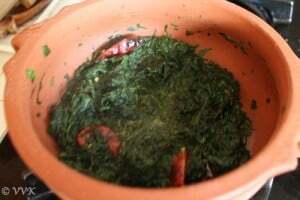 Then soak them in water or fill the clay pot with rice stock or water and leave it overnight. 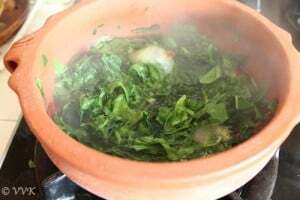 The next day remove the water, wipe it dry and apply coconut oil all over the pot and keep on stove top and heat the empty clay pot under medium heat for 5 minutes. 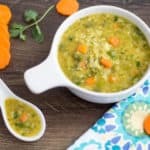 Once it is cooled down, add water or rice stock again and leave it overnight. Repeat steps 2 to 4 for four days. 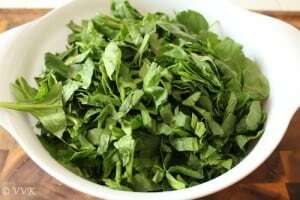 Clean and chop the spinach. Heat the clay pot and once it is hot add the oil. Once the oil is hot, add the mustard seeds, cumin seeds, hing. 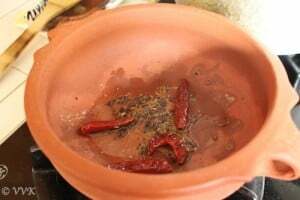 As they start to splutter, reduce the heat to medium and break the red chillies and add it to the same. Now add the turmeric powder, salt and pepper powder. Cover and cook again for 3 to 4 minutes. 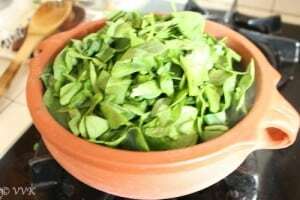 Now using the butter milk churner or matthu, mash the spinach nicely. Cook till all the water evaporates or if you want to be like gravy, add 1 cup of water and mash it again and as it starts to boil turn the heat off. For this quantity, we can add 4 to 5 shallots for additional taste. 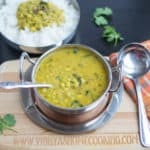 Mashed moog dal can be added like kootu. Adjust the red chillies and salt according to your preference. As I couldn’t find spinach masher/mathu I went with buttermilk churner / thayir mathu. 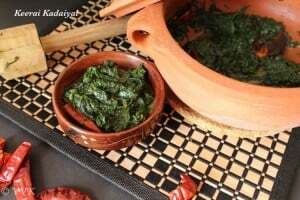 A super simple, humble and healthy spinach recipe prepared in a clay pot in the traditional way and mashed using buttermilk churner. Yeah.. Keerai masiyal la we sometimes add dal too na.. 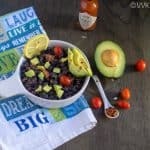 Awesome post and recipe Vidhya. 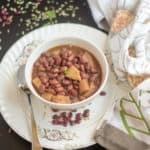 Love your clay pot, Personally I am a big fan of these kind of traditional props…I have some but your clay pot looks so beautiful..especially its lid :-) thanks for the wonderful recipe with a clay pot, I will try! Thanks a lot Rani.. I love traditional props too. This one we can cook and use it as a prop too naa.. ;-) Please do try and let me know how you liked it. Thanks again. 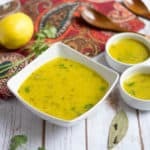 Wow this is an awesome post..not sure how I missed it!..its wonderful to cook in a new way and the results seem stunning as well..very healthy keerai! Thanks a lot Mir. 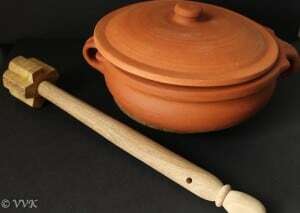 Ancientcookware site has good collection and they have store in amazon too. I got it from there only. Luckily ancientcookware had free shipping going on. So it was pretty convenient. SImply love the clay pot! I am going to ask my dad to bring one. He is a super good packer, so hopefully he can get me one without breaking it. 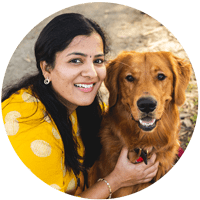 I love keerai masiyal, but can never make like my mom does. Your version looks lovely. I am going to try it soon. 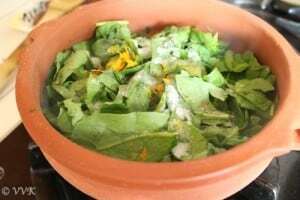 Traditional way of making keerai fantastic and healthy dish..
Lovely keerai masiyal Srividhya!! And I so wish I had a clay pot too. I have never cooked in one yet. Yours looks really great!! 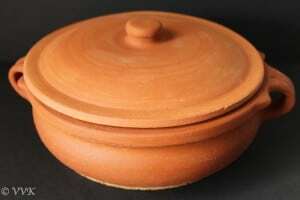 An awesome dish and the way you presented it the authentic way in the clay pot is admirable. Thanks a lot Asiya and welcome to my space. Never cooked in a clay pot. 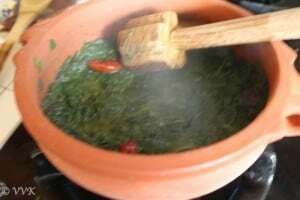 But my aunt uses clay pots for cooking a lot, it gives a earthy taste to the dish. The dish looks very healthy and yummy Srividhya. Beautiful clicks. Very true. Thanks a lot Gayathri. 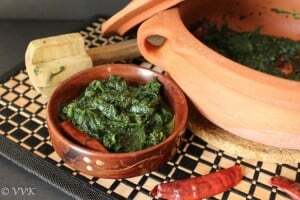 wow..cooking any dish in a clay pot would definitely enhance flavors..very rustic way of cooking..love the dish for its earthy flavors. 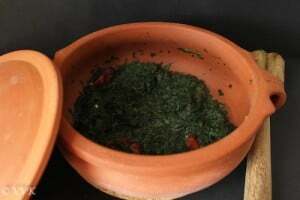 Nothing beats the taste of keerai masiyal made in manchatti,it gives a nice earthy taste. True. Thanks a lot Nalini. Different way of keerai masiyal! Nice! yeah yaar ulta thingy ;-) ;-) . I couldn’t get them here. I have the potato masher but didn’t want to use it on a clay pot. Then thought why not use the butter milk churner. So went with this. Keerai mathu doesn’t have the claws right? Never cooked in earthen pots. 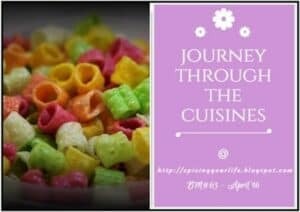 Kudos to you for your trial to cook and present the dish in authentic way. The dish sounds rustic and but I bet it tastes good. This keerai kadaiyal is calling me, can have this healthy dish with some rice and spicy potato fry. Drooling already here. Spicy potato fry and keerai oh yeah perfect combo… thanks oriya. You have to play around a bit to capture steam. I have not tried it myself. I should do it sometime. Awesome Sri.. you managed to get a clay pot! I am super impressed. I am trying to convince S that I need a clay pot too but because of the space constraints, he has been saying no. I love keerai masiyal too and your version sounds very nice. 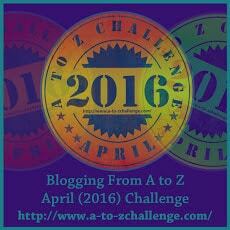 Mine is little different and I so want to try this!